Now available as an audiobook – click HERE for more details! To order in North America, you can visit Amazon, Chapters or Barnes and Noble. Available on Amazon and from all good bookstores. Click HERE for more details. To all who walk the wild ways, may we be the awen. The Hedge Druid’s Craft blends the traditions of Wicca, Witchcraft and Druidry into a spiritual path that uses the techniques of “hedge riding” to travel between the worlds, bringing back wisdom and enchantment into our everyday lives. It is about working with boundaries, with a foot in either world, living around the edges and working with liminal times and places. Yes, it is mostly a solitary endeavour, but there is so much more to it. For all those whose paths meander and often overlap, to those who would not be constrained nor confined by labels, yet who seek some definition, then this book is for you. If you are interested in Witchcraft, Wicca or Druidry, this book will also sing to your soul. “Liminal places hold great power and deep magic; they are spaces between worlds, between times, and between states of being. Learning how to cross these boundaries brings insight, wisdom, and transformation. The Hedge Druid’s Craft by Joanna Van Der Hoeven presents a unique approach to spiritual practice which straddles the worlds between Witchcraft and Druidry, and lays out a clear pathway for those who seek to learn how to ride the hedge in their own work. 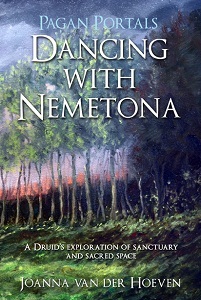 While the book is filled with practical information, accessible tools, and inspired workings, it is van der Hoeven’s beautifully written sharings of her personal experiences and Otherworldly encounters which makes The Hedge Druid’s Craft truly shine.” – Jhenah Telyndru, founder of the Sisterhood of Avalon and author of “Avalon Within”, “The Avalonian Oracle”, and “Rhiannon: Divine Queen of the Celtic Britons”. Honour. Faedriel Falconwing, having grown up in the dark city streets of Loviath Citadel, has known no such thing. Then one day events happen to make her question her way of life and all that she has known. Taken as a child from her elven father, Faedriel was raised by her human mother in the Thieves and Assassins’ Guild. She rose within the ranks of the Guild until one day she is called to kill a priest of the Goddess Morritria, Lady of the Forest. Before she completes her mission, the priest gives her a strange message from the goddess: that she is called to regain her lost honour, and save her soul. Faedriel flees the Citadel and begins the quest to reclaim her elven heritage and her honour. Pursued by the Guild for desertion she finds danger, excitement and love as she tries to win back her soul. This is the first fantasy fiction work by Druid and best-selling author, Joanna van der Hoeven. This book a blend of two distinct and yet similar practices to create a path that is immersed in nature and the present moment. Itis part of Moon Books’ Pagan Portal series. 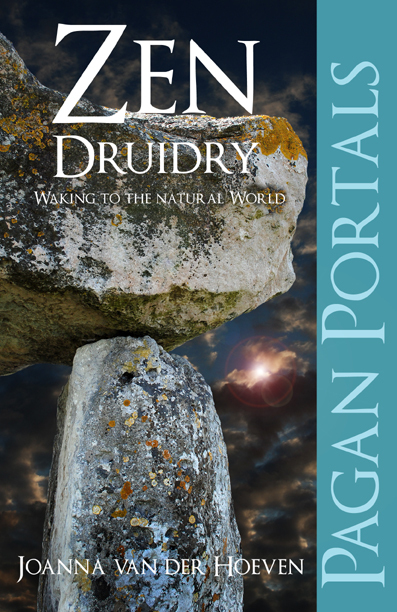 Review by Philip Carr-Gomm: Zen Druidry affirms the richness of this particular combination, and offers an excellent insight into the ways in which the ways of Zen and Druidry can be united to form a rich and meaningful philosophy and way of life. Joanna’s book is one of Moon Books `Pagan Portals’ series, which takes interesting topics and asks writers to cover them in 60 to 70 pages. For those of us haunted by the piles of worthy books we want to read, but simply can’t find the time to get to, a Pagan Portal book offers the tempting prospect of finishing an entire book in one or two sittings. This is not, I know, sufficient reason to recommend a book, but the format forces an author to get to the point and not repeat themselves or expand to fill their requisite 200 pages, and the result as far as I can see is that it works. In this text we explore the concepts of the Dharma (the Buddha’s teachings) and how they relate to the wisdom of the Druid tradition. We also look at the Wheel of the Year in modern Druidry with regards to the Dharma, incorporating the teachings into every seasonal festival in an all-encompassing celebration of nature. We explore meditation, mindfulness, animism and integration with nature, learning how to find sustainable relationship in the work that we do, opening our souls to the here and now and seeing the beauty and wonder that enchants our lives in every waking moment. A collection of writings based on peace, compassion, mindfulness, meditation and more. All proceeds of sale go to charity: The Woodland Trust and Orangutan Appeal UK. Please see The Druid Network for essays written by myself and others within the Druid community. My copy arrived in the mail today – stoked to read it. I have bought two (no, three!) of your books on Google Play (I hope you receive a share of that! ): I have read Zen Druidry, and am now in the process of reading the follow-up Zen for Druids. This I think is going to be my path (hence the double purchase). I wanted to quickly draw your attention to a small slip-of-the-pen on page 122-123 where you wrote “attana” instead of “anatta” (it comes from An-Atman – no Self). There. That’s done. After those two I will move on to “The Awen Alone”. What is your take on the parallel between ‘Zen Druidry’ and ‘Taoism’? It seems that Duidry is a nature-oriented philosophy (Taoism is inspired from nature) and that Zen is Taoist-influenced Buddhism. You might have some material to explore there – especially in the Traditional Chinese Medicine areas that Ovates might draw inspiration from. Most of Tai Chi and Kung Fu is drawn from observations of animals in their natural habitat. Speaking of… what’re your thoughts on a possible druid ‘sport’ or exercise in order to keep our earthly vehicles in tip-top shape? Being fit is part of our responsibility as druids also. Blessings to you and thank you for your generosity in sharing this work with us! Hi Thomas! Thanks for the info – sadly I can’t get a reprint to correct that typo yet, but hopefully will be able to in the future. Regarding Taoism and Druidry, I think Druidry is the Taoism of China, and Taoism is the Druidry of Britain, if you see what I mean. So many religious or spiritual paths are simply a language to express the same principles! Thank you for taking the time to reply. I’ve just finished Awen alone and it’s a wonderful book. I feel the last two chapters were the most personable and important to me with the rest being more informative (necessarily of course, it being an educational book) much of which I’d already assimilated from other sources. But overall a wonderful piece of your time and effort. Thank you for that. May the Awen continue its beautiful work through you! Thank you, and to you, Tom! 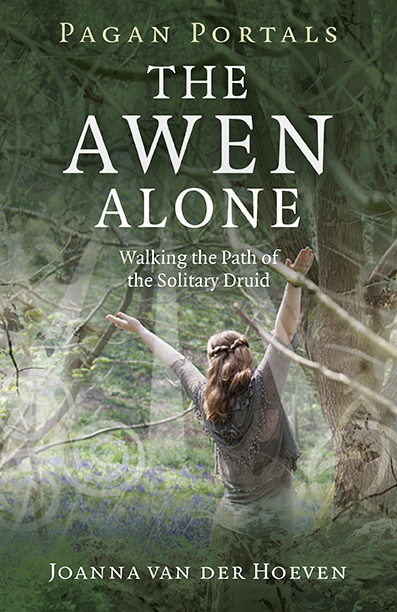 I’ve just read your book “The Stillness Within” and now I started reading “The Awen Alone” they are great. I’d like to know if you have plans to make your courses available by mail. I live in Brazil so it’s too far away and I always felt a connection to Britain and Druidry and your courses seem to be of great value.